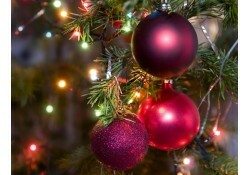 Check out some interesting information on the fresh decorations and fresh ideas on how to decorate for the holiday. An insider look at our farm and our products. Sometimes, the right combination of colors can make door wreaths stand out more than others. If you like a variety of greens with bright and bold colors, Premium Wreaths from Christmas Farms has the collection of wreaths that are sure to please you and impress others. Whether it’s a gift for yourself or another, the colorful door wreaths from Christmas Farms are always a welcome addition to the holidays. If you’ve never had fresh holiday wreaths or real Christmas trees before, or you’ve done them but moved into a new space in the off-season, some preparation should be done before we get to the holidays once again. Premium Wreaths from Christmas Farms can provide your family with the best fresh greens next holiday season, but you want to be sure that they work for your home space before making the commitment. When you have live Christmas Trees from Premium Wreaths by Christmas Farms, you can have not only an aesthetically pleasing, scented tree for the holiday season, but also a great resource to use post-holidays. 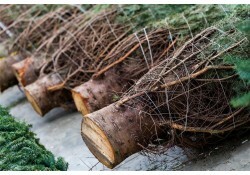 Live trees have a variety of ways that they can be recycled, and we are Christmas Farms encourage you to take advantage of some of these techniques! 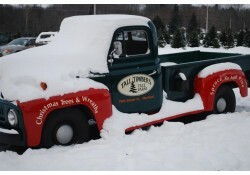 Don’t Miss the Opportunity for Fresh Christmas Trees this Holiday Season! 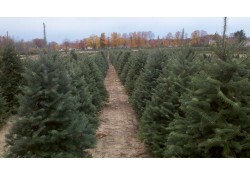 We’re getting down to the wire on this holiday season, and, if you haven’t picked out a tree yet, Christmas Farms has the best fresh Christmas trees to get before family and friends visit you. Our selection of fresh trees is sure to have diminished this close to the holiday season, but don’t let that discourage you from visiting, as we are sure to still have one that will put a smile on you and your guests’ faces. Being based in Michigan ourselves, Premium Wreaths by Christmas Farms take pride in our state and can share with you a Christmas wreath made from our state tree, the white pine. 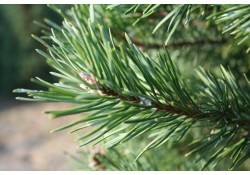 A great choice for a wreath or tree, the white pine can bring a unique look to your decorations for the holidays. Every product from Premium Wreaths is made with professional care and can guarantee your home will look better than ever. 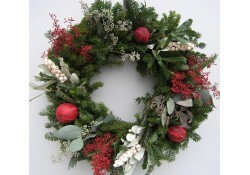 The weather is continuing to cool, getting closer and closer to the time where everyone needs fresh Christmas wreaths. Nothing invokes the holiday spirit like great holiday decorations, and fresh Christmas wreaths from Premium Christmas Wreaths has only the best in stock to help transform your home into the winter wonderland of your dreams. When getting your decorations for the season, make sure to stop by Premium Christmas Wreaths and complete your holiday aesthetic. As we get closer to the holiday season, it’s time to start thinking about what kind of tree you want in your home when the snow hits the ground, and a balsam Christmas tree is the perfect traditional pick. With the simple appearance and the quality of tree that Premium Wreaths by Christmas Farms offers, there’s not better option to complete your holiday decorating this year. Year after year, people working in a business must consider corporate Christmas gifts when the holidays inevitably come around again. As we start to creep into the latter part of this year, the time will come once again to decide on what to get everyone without it being too much of a hassle, but also something that everyone will enjoy. 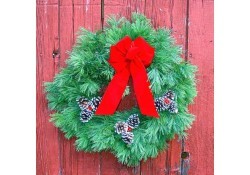 With fresh wreaths from Premium Wreaths by Christmas Farms, your holiday, corporate gift-giving will be better than ever. Has Holiday Wreath Shopping Been a Hassle? 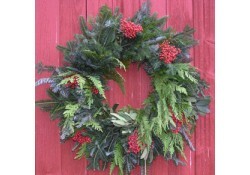 Get Fresh Wreaths Delivered from Christmas Farms! 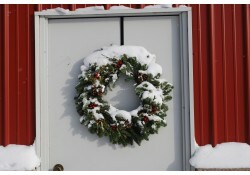 With a farm consisting of just over 100 acres, Christmas Farms offers fresh wreaths delivered of all varieties. Many people enjoy visiting and buying our wreaths in person, but we also offer the option of buying wreaths to have them delivered to your residence or work. Whether you are looking for a corporate gift, or a gift to your family and friends, we guarantee that you will fall love in love with our amazing collection of wreaths. Whether you’ll be celebrating Christmas in July, or just can’t wait for next holiday season before planning what decorations you’ll be hanging, you’ll want to check out a mixed green square Christmas wreath from Christmas Farms. 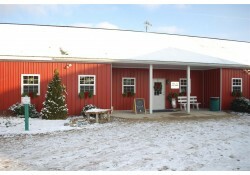 Located in Hartford, Michigan, Christmas Farms brings you the best premium Christmas wreaths, trees, and more that are sure to please the senses. As much as we love the holiday season, we know that the weather can be a downer, and our Christmas wreaths are here to help. The constant overcast and grayed out look of the outdoors can give even the happiest people some mild seasonal depression, and a bright and cheerful Christmas wreath is one way that Christmas Farms can bring back holiday cheer. 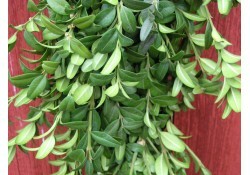 If you’re tired of scratchy needles year after year and don’t want to get a store-bought, artificial decoration, then boxwood garland may be the perfect decoration for you. Showing up more and more in high end design magazines and making an appearance on decoration shows, boxwood is becoming a popular choice for decoration in winter and other seasons too! With the freedom of a length of boxwood garland, you can wrap almost anything and everything, making your home a beautiful holiday work of art. With winter finally reaching an end, many families are preparing to, or have already, taken down their Christmas wreaths until the holiday season returns. However, if your door appears a little too bare, or you’re feeling a certain lack of decoration around your home this spring, then it may be time to repurpose that wreath before it gets boxed for the year. November is when we start planning ways to spread holiday cheer, including to our friends on our corporate Christmas gift list. There are many classic traditions that come with the holiday season, and sending wreaths, garlands and swags show business associates that you truly appreciate them. Wreaths are a fantastic client gift idea. 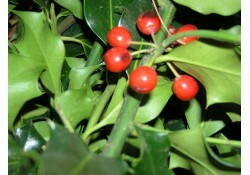 The tradition of giving wreaths dates to ancient Rome when wreaths were gifted as symbols of victory. When you chose to send a festive wreath from Christmas Farms to your clients, you’ll be the winner. Make sending business gifts easier this holiday season by working with our cheerful staff. We take you through the steps of choosing gifts and submitting your list of lucky gift recipients. Beyond the natural beauty of a fresh Christmas tree and the amazing scent, they’re the perfect traditional backdrop to all holiday decorating. Whether you’re decorating you first fresh evergreen at work, or ready to refresh last year’s decorations, there are many fun ideas that tie in with your business for a themed tree. Themed trees can make decorating easier when the central idea is simple – and some themes can reduce storage with recyclable ornaments or ornaments that are easily gifted. Although we often picture Christmas trees dusted with snow or festooned with lights and ornaments, here at Christmas Farms we nurture them through their entire life cycle. 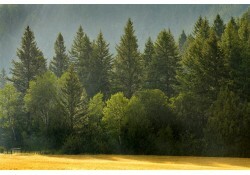 As farmers, the summer is our growing season, a time when we plant new trees and nurture our spruce, fir and pine. With more than 100,000 trees in the ground at any given time, our summer season is our time of preparation. 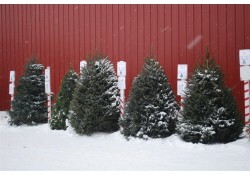 Surrounded by our 100,000 trees here at Christmas Farms, we’re thinking about the Christmas season year-round. But Christmas in July? We think it’s a great time for you to take a moment and join us in planning for the upcoming holiday season! 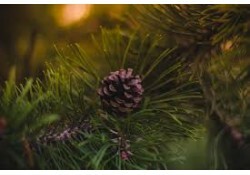 Going by a number of names, including red fir, Douglas spruce, and Oregon pine, the Douglas Fir has long been the country's most beloved Christmas tree. If you grew up in a home that celebrated Christmas, there's a very good chance that – at one point or another – you had one of these beautiful trees in your living room. Known for their soft, greenish-blue needles and their sweet, citrusy fragrance, Douglas Firs are strong and offer good needle retention. 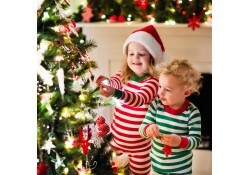 Because of this, they can withstand the weight of copious amounts of ornaments and – better yet – they won't leave a carpet of needles on your living room floor! 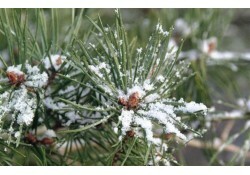 Why Do Evergreens Stay Green All Year Round? 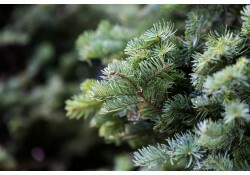 Evergreens are a beacon of hope in the middle of winter, something green amid the gray skies and white landscapes. But why? How are they able to stay green while deciduous trees (oaks, maples, birch, etc.) lose their leaves in the fall? 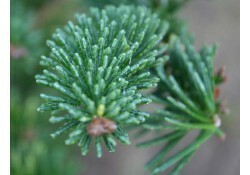 Both evergreens and deciduous trees get their green color from chlorophyll, which is required for photosynthesis, the process which plants use to make their food. It requires both sunlight and water. In the fall, when days get short, and less sunlight is available, deciduous trees lose their chlorophyll, the green fades, and the color show begins. But as the leaves dry out, the fading continues, and the leaves eventually drop. I remember when I was a kid, getting the family Christmas tree was a big deal. We didn't go quite as far as Clark Griswold and family, but it was wonderful. My brothers and sisters, Mom and Dad, would pile into the family sedan, and head out to the country. 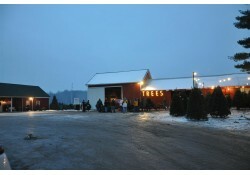 We'd tramp through a tree farm, in search of that one, special, perfect tree. What seemed like hours later (probably no more than 20 minutes), rosy cheeks and with frostbitten toes, we'd climb back in the car while Dad tied the tree to the roof of the car. 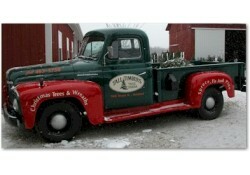 We all know that Premium Christmas Wreaths offers the best fresh Christmas trees in the business. But, after the season is over, what happens to all of those old, dried out trees? After being picked up, many of them are turned into mulch. Others are used as fuel in waste-to-energy plants. Some of them are simply sent to the landfill and forgotten. Well, that's a shame! In Riverside, California, however, things are working a little differently as they've found an ingenious use for their residents' discarded Christmas trees. 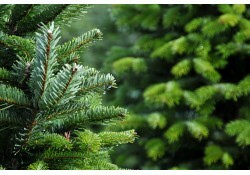 With Christmas behind us, it's time to start thinking about what should be done with your home's Christmas tree. 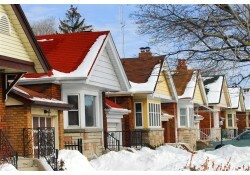 As beautiful as our trees are, they simply aren't intended to be left in the house year round! 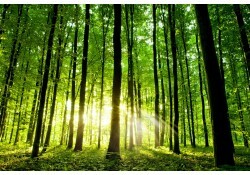 While there are a number of fun projects that can transform you tree into a fish feeder, bird feeder or decorative, outdoor element, the vast majority of people simply want to recycle their tree. In today's post, we're going to give you a few options for recycling your tree and, hopefully, ease your mind and allow you to fully enjoy your post-Christmas relaxation. It’s Not Too Late! 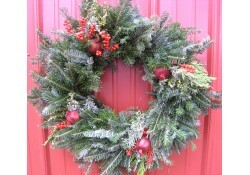 Order Fresh Christmas Wreaths and Trees Now! With December officially upon us and winter slowly rolling in, it's definitely time to start thinking about your Christmas decorations... if you haven't already, that is! From outdoor decorations, such as fresh Christmas wreaths, to indoor decorations, such as the iconic Christmas tree, the team at Premium Christmas Wreaths wants you to know: it's not too late to have fresh Christmas decorations delivered right to your doorstep! 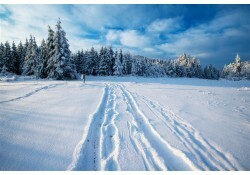 We have a wide range of decorative items that can transform your home – or business – into your own personal winter wonderland. In this post, we're going to look at a handful of items that you can have delivered in time for this year's holiday events. It’s Time to Start Thinking About This Year’s Christmas Tree! 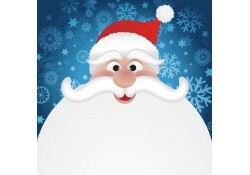 With Thanksgiving around the corner, it's just about time to start making preparations for your Christmas decorations. Chief amongst them, your Christmas tree requires some special considerations. As most families put up their trees the week before Thanksgiving, that leaves roughly one month to settle a handful of very important questions. Are you looking for an extremely tall tree? A tree with a unique fragrance? Or, maybe you're more interested in traditional Christmas trees? Looking for Lavish Decorations but Crunched for Time? 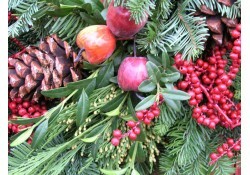 Have Fresh Christmas Wreaths Delivered! If you're just starting to feel the bite of the Christmas bug, you've likely already started mentally shopping for your home's decorations this year. In your mind, you're probably picturing a range of decorations, from glittering tinsel and heirloom ornaments to spirited knickknacks and, of course, the season's most important decoration: the Christmas tree. But, with all of the planning, prepping and primping involved how does one find the time to purchase new adornments? How can you get high-quality Christmas decorations without the hassle associated with department store visits? It's not quite that time of year, just yet, but we all know that department stores are already planning their Christmas decorations so... shouldn't you be planning this year's corporate Christmas gifts? Without a doubt, you have a lot of options available. There's the old standby, chocolate, but what about clients with dietary restrictions or allergies? There's the easy route, gift certificates, but isn't something a little more personal in order? Thankfully, Premium Christmas Wreaths has you covered! With a range of thoughtful gifts available, you can really make an impression on your clients this year and, better yet, you can do it easily and affordably! Next year, when you're looking for a Christmas tree, the team at Premium Christmas Wreaths encourages you to have a plan! We've been in the business for a long time and, knowing how difficult the process can be, we've compiled a few helpful tips that we hope will make the selection process a little bit easier for you. Whether you're looking for a towering Douglas Fir or a more subdued White Spruce, we've got the answers – and suggestions – that you need to make choosing the right Christmas tree a breeze! © 2019 Premium Christmas Wreaths All Rights Reserved.